Can you bake for our Halloween Bake Sale? We’re looking for treats in all shapes and sizes, the spookier the better! Drop off at Pets at Home Harrogate on Saturday 27th or Sunday 28th October. Moorview volunteers will be in store on Sunday 28th from 11am-3pm. Our wonderful events coordinator Michelle Hennon has organised a Hollywood Glamour themed ball to raise money for Moorview Rescue! The event will take place at The Crowne Plaza Hotel, Harrogate and will include welcome drinks, a three course meal, followed by tea and coffee. There will also be Cabaret entertainment from HCDC dance group, followed by a DJ later in the evening. Tickets cost just £45 and are on sale now! Please contact Michelle Hennon at michellehennon8@gmail.com for more information. 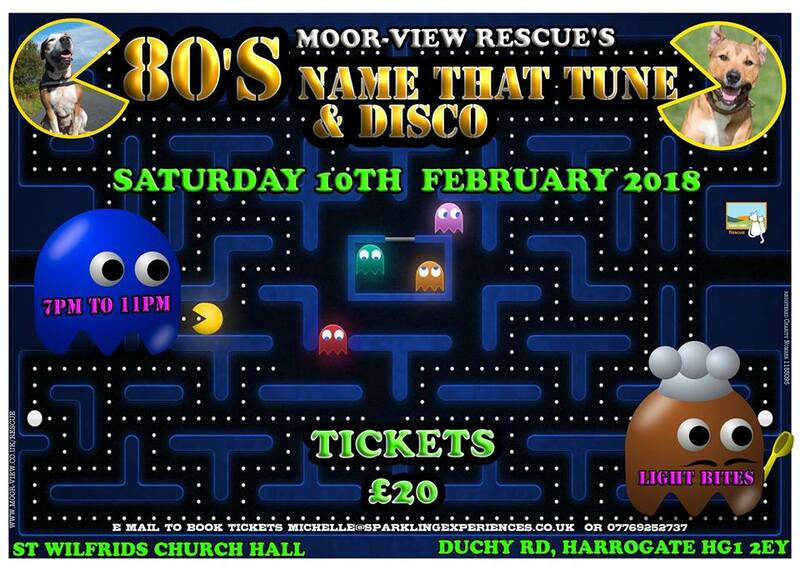 Get your 80's outfit at the ready for another fun evening with Moorview Rescue! We'll be having a Name That Tune Quiz, followed by an 80's Disco. The event will be held in St Wilfrid's Church in Harrogate on Saturday 10th February. Tickets cost £20 and will include a light bite to eat. Please message michelle@sparklingexperiences.co.uk for more information. Hosted by Sparkling Experiences Events for Moorview Rescue with Quiz Master Raymond Pettitt and DJ Andy Sumner. Sponsored by Karen Price Photography. Fancy helping raising some money for the Moorview dogs this Christmas but aren't sure how? Well come along to Michelle Hennon's Dance your Pants Off fitness class! This zumba-style class, on from 1pm-2pm, is sure to warm you up on a winter's day, and make you feel much less guilty about indulging in a luxury prosecco afternoon tea which will be served at 2.30pm! Please also feel free to attend if you only wish to indulge in afternoon tea OR just want to take part in the fitness class! Christmas is a wonderful time for lots of people; however it is a time when the rescue centre gets very busy. Rescue centres tend to see a large increase in unwanted and abandoned pets in the New Year. So to prepare, we like to do lots of fundraising to make sure we can offer as much support to those pets that end up needing our help. As well as Michelle Hennon’s Dance Your Pants Off/Prosecco Afternoon Tea event on Saturday 9th December, we have another event planned, but we need your help! We have partnered with Pets at Home Harrogate for their Santa Paws Fundraiser. Last year’s event raised a whopping £2,500 for Moorview Rescue, and this year the target is to hit £3,000! All we need to qualify for this amazing fund is to give 2 days of volunteer support in the month of December. Pets at Home staff will be holding a doggy tombola and ‘Give a Dog a Christmas Dinner on the till where they donate £1. We’d also like to do some Christmas baking and mince pies to sell. We’re looking for 3-4 people on the Saturday and 2-3 people on the Sunday to help us out! You’ll be representing the rescue, answering any questions, and encouraging people to donate! You’ll be prepped before with up to date information about the dogs we have in, and be provided with leaflets if anyone want more information. We’ll be looking for people to spend some time in the store from 11am-4pm on each day, but any time you can donate would be great – even just an hour! Please get in touch if you can help! December is a hard time to get volunteers so we really need as much help as we can to make sure we qualify for this amazing donation from Pets at Home in association for Support Adoption For Pets. Pull out your cowboy boots and get ready to hoe-down! It's the Moorview Rescue Country & Western Night! Get ready to line dance into the night with Moorview Rescue on Friday 17th November 2017. We'll be having live music from John Dean, and Line Dancing Lessons with Cathy Hodgson. Tickets cost just £20 per person and include light bites. Contact Michelle at michelle@sparklingexperiences.co.uk for tickets. Do you want to help your local animal charity Moorview Rescue? f the answer is YES to any of the above, then get yourself down to Pets at Home on Sunday 22nd October 2017 for a Halloween themed bake sale! We'll be selling sweet treats and rescue products to raise money for the rescue, and you may even bump into a rescue dog or two! We're going to be at Birstwith Show! More details coming soon! The show has kept many of its core elements since it was founded in 1867. The spirit of the show remains, it is a really jolly day out for visitors, exhibitors and competitors, and children particularly have a great time, even the many volunteers seem to enjoy the day, particularly in the pub afterwards when all is tidied away for another year. We are always in need of willing pairs of hands, from committee members to helpers in the week prior to the show and on the day. Please contact the secretary Amy Holmes if you can spare some time. Exhibitors were and still are, an essential element of the show, giving the populace at large a chance to show off growing skills, also their craft and artistic talent. Bonny babies and handsome dogs are a significant part of the day, entries on the field on Show Day. See the schedule for all the entry classes and start making or growing.Local horticultural show with a brass band, children's activities and an acoustic stage. Join us for great food, good music and a drink from the bar. More details to follow nearer the time. Tickets available before the day from The Station or Dales Stores or on the day from the info point. You can also pay on the night at the gate. Do you live in the Harrogate area? Are you free on Saturday July 15th? Would you like to help raise some much needed funds for Moorview Rescue? Well Lydia and Lisa are holding a Swishing Party in Harrogate on Saturday 15th July! Swishing is the latest craze in ethical shopping, it’s the future for the fashion forward socially responsible consumer who wants to raise funds and improve their wardrobe at the same time. Swishing parties are a great way of fundraising and gives you the chance to get rid of the items in your wardrobe you no longer need, no longer fit, unwanted gifts and unmitigated fashion disasters. Improve your wardrobe by exchanging items for some new outfits! You must bring a minimum of 5 items to swap (can include clothing, jewelry, and other accessories). And why not bring a bottle of wine to enjoy whilst browsing the rails? We are in need of bakers to rustle up some delicious home baking, and also volunteers on the day. The slots are 11am-1pm and 1pm-3pm. Please comment on this post or contact katieleeabbott20@live.co.uk if you can help! Katie (and hopefully other volunteers!) will be at Pets at Home from 11-3pm on Sunday 2nd July selling home baked treats! We'll also have rescue products and information on dogs available for adoption! Come on down to help raise some much needed pennies for the dogs! We are also looking for Event Sponsors. Sponsorship offers business advertising on the website and at the event. Please email michellehennon8@gmail.com for more information. We'll be hosting an Easter Themed Bake Sale at Pets at Home the weekend before Easter. Pop in store to bag yourself a treat and meet some of the Moorview Dogs. We'll also be selling Rescue Products and Easter Raffle Tickets. We're looking for baking volunteers to challenge themselves to Easter baking. It could be a cake, cupcakes, tray bakes or Easter nests. We'll do a shoutout on facebook to the most creative! Please email katieleeabbott20@live.co.uk If you think you can help. Head on down to St Cuthbert's Church in Pateley Bridge for a Coffee Morning! Head down to Fight Night at The Den Saturday 4th March! The Den, who have supported Moorview many many times in the past, are showing the Haye vs Bellew fight and donating the £3 entry fee to the rescue doggies here at Moorview Rescue! We'd like to say a MASSIVE thank you to The Den and hope you will all pop down for a pint! We’re going to be at Pets at Home Harrogate on Sunday 12th February for a Valentine’s Day themed bake sale! Pop down to say hi and treat yourself or your loved one to a sweet treat! We’ll also have rescue products, cards and calendars available. Please contact Katie at katieleeabbott20@live.co.uk if you can help with baking. Tickets are now on sale for the 80's Themed 'Name that Tune' Quiz Night on Saturday February 4th at St Wilfrids Church, Duchy Road, Harrogate from 7pm-11pm. We did it in early 2016 and it was such a hoot so we decided to run it again! Tickets are £15.00 and all money raised goes to Moor-View Rescue. We will be hosting an 80' music quiz followed by a disco afterwards with Andy Sumner from AJS Productions who doubles up as the photographer! Please message michellehennon8@gmail.com to book tickets. Moorview Christmas Jumper Carol Concert Spectacular! Save the Date for our Christmas Carols Spectacular on Sunday 11th December. We would love for you to come and join us at Pateley Bridge Memorial Hall between 2pm and 4pm for Christmas carols, home baking, Moorview merchandise and mulled wine! We hope the kind people of Harrogate (and further afield!) will donate to our Present Drop on Sunday 11th December at Pets at Home, Harrogate. We will also be LIVE streaming the dogs opening their presents, later that afternoon. We are very excited to be holding a Country & Western Themed Fundraiser on Friday 11th November at St Winifred's Church in Harrogate. With live music from the band 'Honky Tonkin' and the fabulous line dance instructor, Cathy Hodgson! Tickets are £20 and include a cold buffet.